Starred Review in Publisher's Weekly for Can I See Your I.D.? "In 10 impeccably crafted profiles, Barton (The Day-Glo Brothers) shares the stories of individuals—many just teenagers—who adopted false identities for amusement, profit, or survival. From Sarah Rosetta Wakeman, who disguised herself as a man to fight in the Civil War, to 16-year-old Keron Thomas, who in 1993 impersonated a transit worker to fulfill his dream of piloting a New York City subway train, Barton reveals the motivations behind and the consequences of each deception. "The use of second-person narration is very effective, allowing readers to assume the identities of each individual. Barton's prose captures the daring, ingenuity, and quick thinking required of each imposter ("You can bluster and grumble with the best of them.... You use up your share of tobacco too," he writes of Wakeman). "In the most powerful stories, assuming a false identity was a life or death decision, as with Soloman Perel, a Jewish teenager who joined the Hitler Youth to escape being killed, and Ellen Craft, a slave who disguised herself as a white Southern gentleman to escape to the North. [Illustrator Paul] Hoppe contributes dynamic comic book–style panel art." It's been so exciting to see all the terrific buzz surrounding Trent Reedy's debut WORDS IN THE DUST, including many great reviews featured in a previous post. Now there's yet another reason to celebrate: on the latest edition of the Today Show, Al Roker announced that he has chosen WORDS IN THE DUST as his next book club selection! See the brief announcement at the end of this video . . . and stay tuned in April to see Trent discuss his novel with the kids of Al's Book Club—and with an ever-growing audience of kids all over the country. As if the recent news of more shenanigans to come from Shark and Train wasn't enough, more excitement keeps pouring in for these two and author Chris Barton. The latest? Shark Vs. Train is one of five finalists for Kindergarten to Second Grade Book of the Year in the Children's Choice Book Awards! The Children's Choice Book Awards, sponsored by the Children's Book Council in association with Every Child a Reader, are the only national children's book award program where the winning titles are selected by young readers of all ages. Children can cast their vote through April 29 at bookstores, school libraries, and online. Over 16,000 young people's selections in the IRA-CBC Children's Choices program led to the list of 30 finalists in six categories. 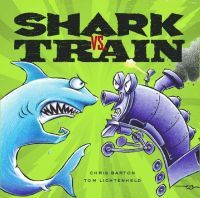 Winners will be announced live at the annual Children's Book Choice Awards Gala on May 2nd as part of Children's Book Week, the oldest national literacy event in the U.S.
Alvina Ling at Little, Brown has bought world rights for Chris Barton and Tom Lichtenheld’s companion picture book to Shark vs. Train, for publication in spring 2013. Erin Murphy at Erin Murphy Literary Agency is the agent for the author, and Amy Rennert at the Amy Rennert Agency is the agent for the artist. The new book is scheduled for spring 2013. Shark Vs. Train is the New York Times bestselling book, named to several major "best of the year" lists last year, that asks the question: Who will win? We know the answer: Chris Barton! Does the arrival of a mysterious man in a green car presage a miracle on Orange Street? Does the orange cone in front of the empty lot where the last majestic orange tree stood mean trouble? The tree was rooted in the lives of four kids. Bunny, age nine, has OCD and worries every time her mother flies. Leandra lives at 301½ above the garage with her grandparents because her mother is pregnant. Ali has a toddler brother who has stopped talking after a hospital stay. Lonely Robert is a chubby would-be magician with a crush on Ali. The segments of their lives cluster around the orange tree that holds secrets in the dirt, shelters hummingbird nests and provides California shade. There’s also Manny, the dreadlocked nanny for Ali’s brother, and Ms. Snoops, whose memory is like a lacy antimacassar, with holes. Unfolding in one day’s time, the story recounts how secrets are revealed, curiosity is satisfied and wishing becomes hope because the spirit and ties of friendship and community are resilient and strong. Fully realized characters and setting definitely make this one morning on Orange Street amazing. Blood and Flowers, by Penny Blubaugh, a young adult novel about an outlaw puppet troupe and their foray into the land of faerie, published by Balzer + Bray/HarperCollins. Noodle and Lou, by Liz Garton Scanlon, a picture book about unflagging friendship illustrated by Arthur Howard and published by Simon and Schuster's Beach Lane Books. Oh, How Sylvester Can Pester! (And Other Poems More or Less about Manners), by Robert Kinerk, a picture book poetry collection illustrated by Drazen Kozjan and published by Simon and Schuster's Paula Wiseman Books. Your Mommy Was Just Like You, by Kelly Bennett, a picture book companion to Your Daddy Was Just Like You, illustrated by David Walker and published by G.P. Putnam's Sons/Penguin.